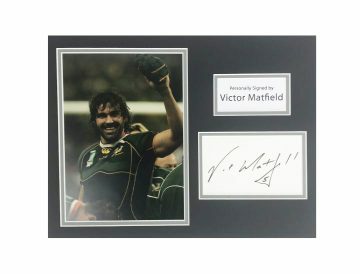 Shop signed South Africa rugby memorabilia including signed Springboks shirts, rugby balls and photographic displays. Most with photo proof, all with fast worldwide shipping, free UK delivery and Certificate of Authenticity! South Africa’s national rugby team Springboks are a force to be reckoned with in the world of rugby union. For over one hundred years they’ve been a dominant side in international competition, consistently wowing on the world stage and winning championships at the top level of the sport. Rugby was first introduced to South Africa in the mid to late 1800s, participating in their first official tour in 1981. Despite being new to the game (and still learning the ropes) they excelled against touring side Britain and since then have remained a respected side in world rugby. The nickname ‘Springboks’ was coined in 1906 – and it’s stuck ever since. As one of the ‘Tri-Nations’ every three years South Africa competes with Australia, Argentina and New Zealand in The Rugby Championship, which they’ve won three times in 1998, 2004 and 2009. Although they left the sport for a period of time due to anti-apartheid boycotting measures, the side quickly rebuilt respect and their status in the game upon their return. They have played in 6 of 8 Rugby World Cups tournaments, winning twice. These two wins set them aside as one of three of the best performing teams alongside New Zealand and Australia. Over the years they’ve remained within the top few nations in World Rugby Rankings – occupying the top spot at their best and dropping to seventh at their lowest. Playing in their iconic illustrious green and gold, the Springboks (also known as Bokke and Amabokoboko) are widely associated with their leaping Springbok and Protea emblem. Many unforgettable moments mark the nation’s history in rugby – including hosting and winning the 1995 Rugby World Cup, where Nelson Mandela presented the trophy to the triumphant home team. 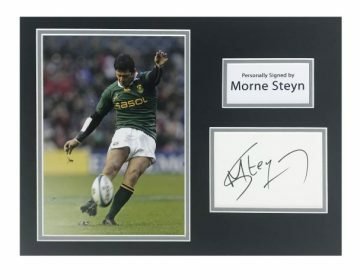 Signed South Africa Springboks rugby memorabilia is like gold dust – rare and extremely valuable. 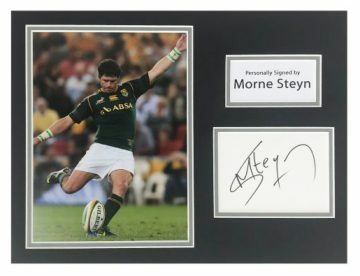 Here at Firma Stella we have collected some of South African rugby’s finest collectable items, from signed shirts and rugby balls to mounted photographs and displays. 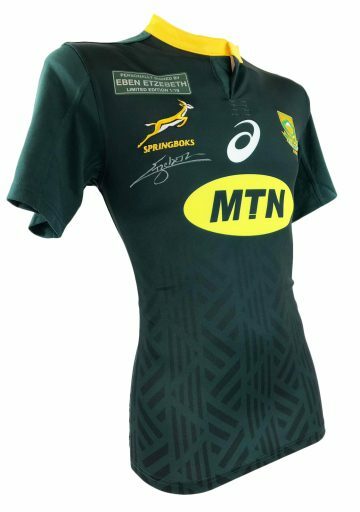 Designed to stand the test of time and serve as valuable investments, each extra-special piece is ideal either for avid Springboks fans or savvy collectors.